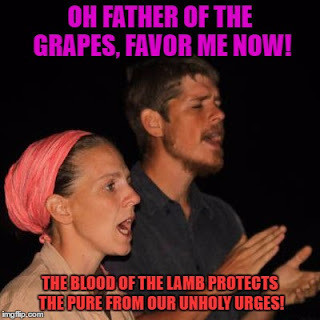 "The head Pharisee in Har Bracha approves of our work!" Several years ago, noted Hebron activist David Wilder wrote an article where he correctly identified Tommy Waller and his "Hayovel" ministry as missionaries. After assessing the evidence and internalizing Waller's own damning words and actions, David Wilder was honest enough to reconsider his previous friendship and inform the public. It was evident to Wilder that Waller was bad news. The fact that David Wilder no longer comments on this issue today is unfortunate, but he has never retracted his words. And even if he did, what would that mean? Clearly, at the time of his admission, he was terribly disturbed by Waller and his terrible ruse. "We spent quite a nice day together, and talked quite a bit. Tommy seemed somewhat upset about the fact that some Jews in Israel suspect him of missionary work, which he denied vigorously. I was a little taken aback by the seeming defensiveness of his comments, numerously repeated. I was also a little upset when he suggested that the dialogue he initiated, also be carried over into the ‘messianic Christian’ community in Israel . 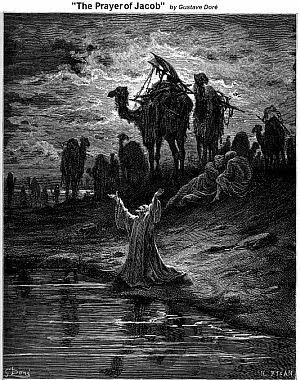 ‘Messianics’ are former Jews who have accepted jesus as a deity. I told him that this wasn’t a very good idea; that these people are very dangerous, actively and deceptively attempting to convert Jews, and that any contact with them was to be rejected. He didn’t answer, but didn’t look overly happy with my comments. I let it pass." Commentary: The first notion that something was wrong. Most Hayovel supporters usually bury their heads in the sand at this point and they begin to make rationalizations. The Waller family is also prominently featured in Korean-made movie about Ortiz called ‘Restoration,’ and extremely anti-Israel, anti-Semitic feature, parts of which can be viewed here: http://goo.gl/60m1N." Commentary: Wilder's gut reaction receives confirmation. But there was more to come. 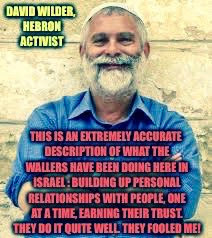 This is an extremely accurate description of what the Wallers have been doing here in Israel : building up personal relationships with people, one at a time, earning their trust. They do it quite well. They fooled me!" Shouldn't Yishai Fleisher have a conversation with Wilder? 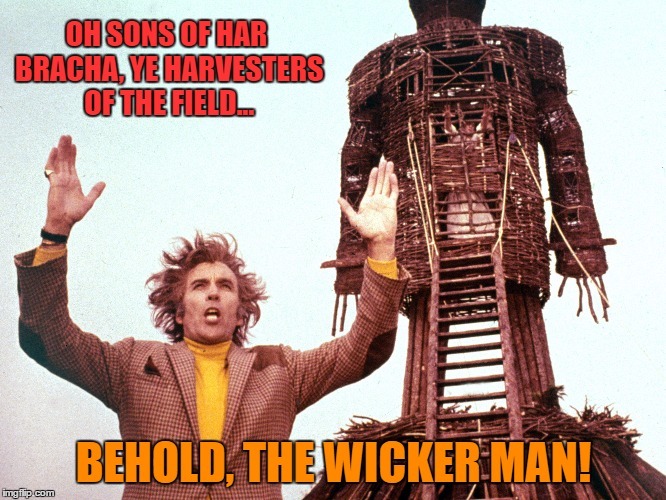 In light of the evidence, we have another troubling issue to contend with. Zehut's Moshe Feiglin needs to explain to the public why Hayovel supporter Yishai Fleisher is running for a slot in his party. And I don't want to hear about freedom of expression and libertarian values. The Torah understood free will better than any proponent of libertarianism. And no person involved with evangelicals and missionaries should be associated in any way with a Jewish party. Fleisher can rant all day and troll this blog ( he has) about how he is "more anti-missionary than we are". The facts remain facts and if Fleisher won't be honest, Moshe Feiglin wil have to address the issue eventually. Because there is a small army of Jews who don't give a damn that the craven masses are afraid to stand up to a handful of self-serving Jewish bullies whose actions (whether misguided or not) are endangering the Jewish people. 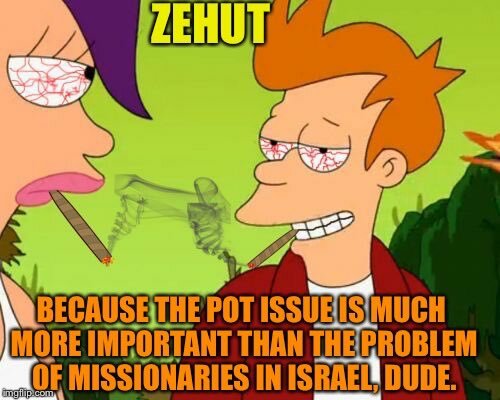 I would venture to say that this is a greater issue than the legalization of cannabis in Israel. What is your position on interacting with evangelicals, missionaries, messianic movements and the like? Do you approve of taking money and forming alliances with such groups? What Rabbi or Torah figure do you refer to when assessing these issues as it relates to your organization? What is your position on Hayovel? Does Zehut support their efforts? If not, how can you reconcile Yishai Fleisher's involvement in the party? Fleisher also has associations with Mike Huckabee (who supports the missionary organization "One For Israel") and was even photographed with notorious missionary Mike Isley. Why is the issue of interfaith relations, dialogue, and associations not addressed prominently in Zehut's platform? Why are there internal rumblings (we are aware of them) in Zehut over this issue, and why should these murmurings not concern Jews who might consider voting for Zehut? 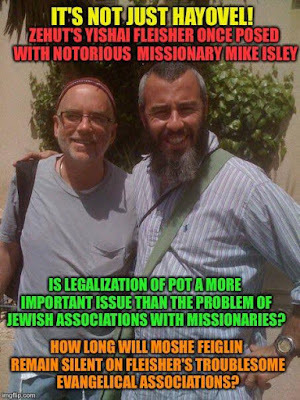 Please answer these pressing questions, Moshe. Because we will continue to ask them. Rosh Hashana draws near. And these troubling problems are the spiritual equivalent of the Arab/Islamic threat. The Jewish soul is in danger in Eretz Yisrael. 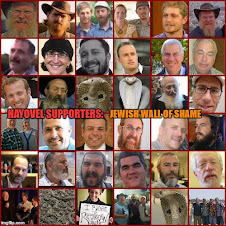 Hayovel is a primary player on the scene today, and they have tentacles in the Shomron. I would hope that Zehut doesn't decide to ignore and whitewash these issues, and thus perpetuate the scourge of corruption involving Jewish collusion with missionaries.